You'll be £16.99 closer to your next £10.00 credit when you purchase Dr. Benjamin Church, Spy. What's this? Dr. Benjamin Church, Jr. (1734–1778) was a respected medical man and civic leader in Boston who was accused of being an agent for the British, providing compromising intelligence about the plans of the leadership in Massachusetts as well as important information from the First Continental Congress in Philadelphia. Despite his eminence as a surgeon, his own correspondence, and the numbers of references to him from contemporaries, no known image of him exists and many aspects of his life remain obscure. What we do know is that George Washington accused him of being a traitor to the colonial cause and had him arrested and tried. Found guilty and jailed, he continued to profess his innocence, and was allowed to leave America on a British vessel in 1778, but it foundered in the Atlantic with all hands lost. The question of whether Church was working for the British has never been conclusively demonstrated, and remains among the mysteries of the American Revolution. 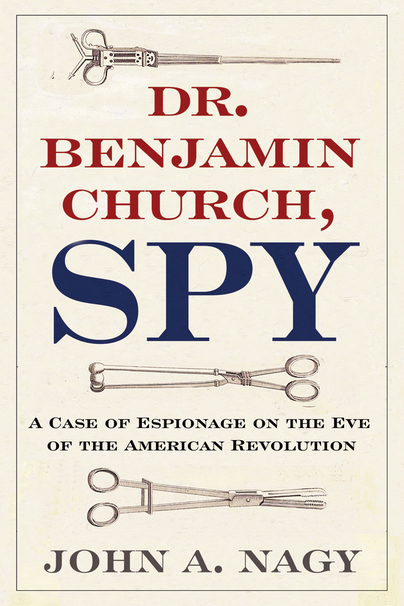 In Dr. Benjamin Church, Spy: A Case of Espionage on the Eve of the American Revolution, noted authority John A. Nagy has scoured original documents to establish the best case against Church, identifying for the first time correspondence and reports containing references to the doctor and his activities, including an incriminating coded letter composed by Church to his British contact. Nagy shows that at the cusp of the revolution, when the possibility—let alone the outcome—of an American colonial rebellion was far from assured, Church sought to align himself with the side he thought would emerge victorious—the British crown—and thus line his pockets with money that he desperately needed. A fascinating investigation into a centuries-old intrigue, this well-researched volume is an important contribution to American Revolution scholarship. Revolution, also available from Westholme Publishing.